Students of the Graduate Writing Program participated in a fun letterpress workshop in the Otis Lab Press. Chair Paul Vangelisti and faculty member Guy Bennett welcomed instructors Kathleen Burch and John McBride from the San Francisco Center for the Book. 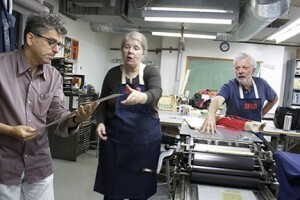 These two distinguished visitors spent the evening exposing Otis writers to the Black Art of letterpress printing. 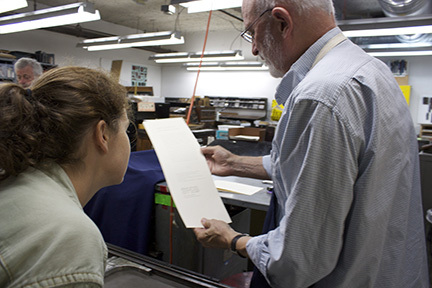 Check out the pictures to see Creative Writing student pulling a print on Liz, one of our Vandercook Flatbed Cylinder Presses. 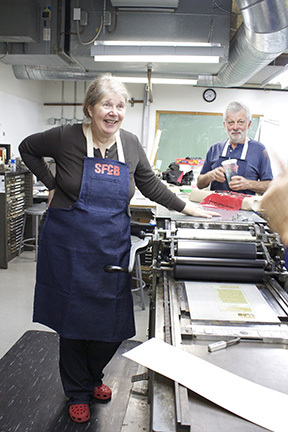 The one we received from the USC Graduate Book Arts program, now defunct . Small World.